I recently attended the Australian premiere of the Henry Selick directed animated 3D stop-motion film “Coraline”, starring voice actors Dakota Fanning, Teri Hatcher, John Hodgman and Dawn French. Asking questions like “which father would you rather?” and “which mom is more fun?” the underlying lesson of the movie to all of us is “be careful what you wish for”. Adapted from Neil Gaiman’s children’s novel, the plot centres around the adventures of a young girl, “Coraline” who moves to a new home with her writer parents and feels they don’t care about her. 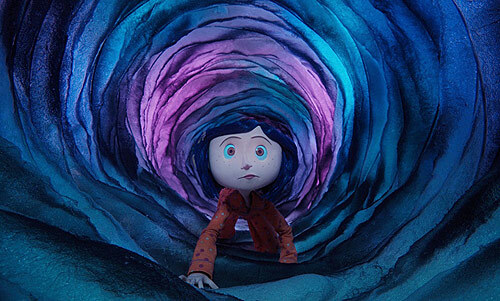 The visuals were great especially in scenes where Coraline visits “the other world” and reminiscent of Selick’s previous work in “The Nightmare Before Christmas”. Saw the 3D version of this with my 5 year old son today – wonderful! The themes may have gone over his head a little, but the visual entertainment alone was worth the pricey ticket. He loved the groovy 3D glasses that were hard plastic and looked like something out of Risky Business. There were some parts of the movie a little scary but he just shut his eyes and cuddled closer during those moments. I liked the fact it was a kids movie dealing with a modern family situation – busy parents both working from home from their computers and sometimes not having enough hours in the day to spend with their child – could totally relate. Two thumbs up from both of us.